Should corporate leaders focus on short-term gains or take the long view? Adherents of long-term management will find potent ammunition in a new study from a pair of management researchers who conclude that myopic leaders are hampering businesses by failing to invest in innovation and risky projects. What’s more, they say that switching to a long-term outlook can improve a company’s operating performance by several measures—return on assets, operating profits, and sales growth—within two years. Simply put, an increased long-term orientation fosters innovation and enhances market value, argue authors Caroline Flammer of Boston University’s Questrom School of Business and Pratima Bansal of the University of Western Ontario’s Ivey Business School. Their paper, “Does a Long-Term Orientation Create Value?,” is slated to publish in a coming issue of the Strategic Management Journal. To determine whether executives with a long view logged better performance, researchers identified 808 shareholder proposals on long-term executive compensation between 1997 and 2012, and examined the measures that passed by a small margin of votes. The executive compensation proposals included awards of restricted stock, restricted stock options, and long-term incentive plans. The researchers measured the effects of approved proposals during the year of passage, one year later, and then three years after passage. The authors set out to study companies whose leaders had made a clear break with short-termism. So they zeroed in on chief executives who may not have seen the changes coming in the form of narrowly passed long-term incentive proposals. The compensation adjustments led chief executives to pursue longer-term strategies. Following the passage of long-term incentives, the researchers found that companies boosted their efforts to innovate and pursue riskier forward-looking projects. More specifically, businesses increased their research and development spending, which led to surges in the number of patents they garnered. 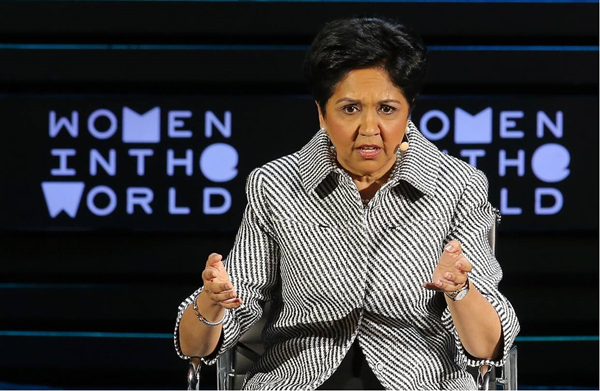 The long-term view is exemplified by PepsiCo Inc. CEO Indra Nooyi. Ms. Nooyi identified health and wellness as one of the company’s biggest growth opportunities when she became chief executive in 2006. She has boosted R&D spending and vowed to turn the maker of sugary soft drinks into a company where sales growth of healthy products outpaces the rest of the portfolio by 2025. Ms. Flammer warns that the research findings may not hold true for small public companies and firms that have passive shareholders. There is a hidden gem in the research for short-term adherents, too. Ms. Flammer and Ms. Bansal found that companies whose boards narrowly approved long-term executive incentive proposals saw their share prices jump 1.14% on the day the measures passed, compared with companies where shareholder proposals were narrowly rejected. 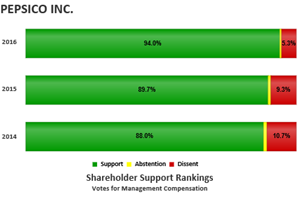 The following graphs of corporate performance and of shareholder voting support for executive compensation are presented for the company addressed in the article with relevant market comparisons. 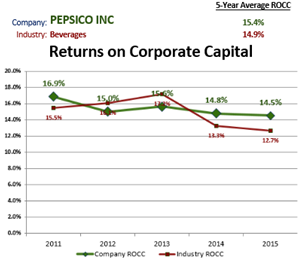 Returns on Corporate Capital™ are a performance measurement developed in a Shareholder Forum workshop project, and are calculated from the company’s SEC reports of its GAAP-defined net income plus interest expense and income taxes, divided by its prior year’s ending balance of total assets less current liabilities other than interest-bearing debt. Comparative averages for the company's industry are based on aggregate amounts for all reporting Russell 3000 companies in the six-digit Global Industry Classification Standard (GICS), excluding the amounts for the subject company.